I'll say this for the English -- they know how to make a very tasty beef tongue! Hugh's recipe came out beautifully and made a delicious corned beef tongue. Flavor-wise, you could taste a deep resonating spice from the cloves, juniper, and peppercorns in each bite of the meat. Texturally, the beef was much gentler than regular tongue. While still a dense meat, I found it to be tender and not quite as heavy tasting. In the picture, you can see that classic, ribbon-y texture familiar to anyone who's enjoyed corned beef brisket. 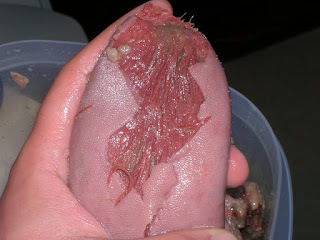 If I was going to serve tongue to offal-ly unconverted friends, I think I'd serve them this corned beef tongue. Also with just tasting great, the tongue took on a texture that was much easier to eat and wouldn't tip off the diners to the fact that they were eating something other than skeletal muscle. The addition of sodium nitrite is responsible for the lovely rose color of the cooked meat. Unlike a regular brisket, I noticed the pink didn't penetrate all the was to the core of the tongue. I'm not sure if that's because the meat is just so dense to start, or perhaps because I didn't leave it in the brine long enough. But not wanting an overly salty end product, I'm happy with this recipe and eager to try it again.